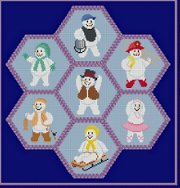 This collection of designs shows snow people in various human forms. Images may be used separately or together. Waste canvas allows individual images to be added to anything stitchable. Some colors use small amounts of floss. Download Only: $7.99 You will download the pattern. Nothing will be mailed, so you pay no printing or shipping charges.